This special program offers non-Japanese students an opportunity to work toward Doctor of Engineering (3 years) or Master of Engineering (2 years) degrees. Top qualified students who passed the September Application will be awarded scholarships including the Japanese Government's Scholarship (MEXT: The Ministry of Education, Culture, Sports, Science and Technology) and other equivalent scholarships provided by IME Graduate Program. We also seek for highly qualified students to enroll as self-supporting students. All of the students will be enrolled in one of the departments below. Students awarded the MEXT scholarships are exempt from the above fees. 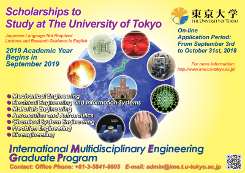 Top September Applicants who have exceptional academic records will be awarded the Japanese Government's MEXT scholarship by recommendation of the University of Tokyo or scholarships provided by IME Graduate Program for the period of either the Doctoral program or the Masters program. The MEXT Scholarship grantees are exempt from Entrance Fee and Annual Tuition Fees throughout their entire term of study. *The additional stipend varies according to the student's "principal place of research," regardless of place of residence. The MEXT Scholarship will not be offered to students who are already receiving grants from other sources. If you apply for the Japanese Government's MEXT Scholarship by obtaining the recommendation of the Japanese Embassy in your country, you will not be eligible to enroll in this program. Instead, you will have to initially enroll as a research student and then later take a regular entrance examination to be admitted to the graduate courses. *The total amount of scholarship stipend guaranteed by (2)(3)(4) is almost the same as (1). *The number of each scholarship may vary every year. IME Students who are not awarded any scholarship, including the scholarships other than the ones offered by IME Graduate program, are called self-supporting students: they are responsible for their own fees and living expenses. After entering The University of Tokyo, self-supporting students have chances to apply for several kinds of private scholarships. However, please note that many well qualified students compete for these scholarships and that the scholarship amounts are often lower than the MEXT Scholarship. Basically there are almost no scholarships available before your enrollment. Self-supporting students can apply for the exemption of Entrance Fee and Annual Tuition, Entrance Fee could be exempted up to a half of the full amount. Annual Tuition could be exempted a half or the whole of the total amount. 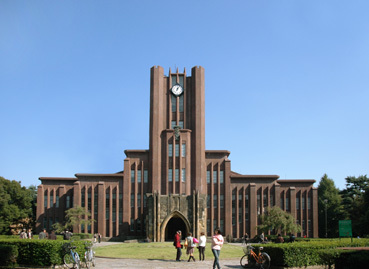 The Graduate Council of the University of Tokyo grants admission to this program based upon the recommendation of the School of Engineering. Screening for admission is based both on the evaluation of documents submitted by the international students and, if necessary, on the Internet interviews and examinations conducted by the faculty. There are two application periods in each academic year. (September Enrollment Only) When the evaluation process is complete, applicants who are evaluated as qualified and meet the IME criteria will be granted admission to this program. At September Application, top qualified applicants among them will be nominated as candidates for scholarships provided by IME Graduate Program. *When you apply during this application period, you will automatically be included in the selection for these 4 types of scholarship offered by the IME Graduate Program. The nominees of the scholarships from (1) to (4) are informed of their nomination. For details, please refer to Requirements for Eligibility. Note: This is an approximate schedule and it is subject to minor changes. [Form 2]: Please provide your academic grades (1-6) as stated officially in your transcript. If your school doesn’t provide you with GPA and if you can calculate it yourself, please calculate it and fill it in. In that case, please be sure to attach the conversion chart when you submit the transcript. (Please refer to no.9, 10 as well.). [Note] Please be sure to confirm the information you have written and sign on the last page of the forms. Go to the Educational Background page of T-cens and work on it. AF5-1: List of scholarships, prizes, honors, awards and other recognitions, if any. Please refer to the "Recommendations" page for detailed instructions about how to prepare these recommendation letters. Both must be the faculty member of the university and one of them must be your direct academic supervisor. It would be preferable if the other is from Dean or head of Department of the university you belong to or graduated from. If you haven’t completed your course yet, you are requested to submit all the academic transcript you have received by the time of application. One original or one certified copy (with certified seal/stamp of the university you belong to or graduated from) is required. Photocopy without certified seal/stamp will not be accepted. If GPA is not stated in the transcript, and if your school can issue the authorized certificate of your GPA or your class rank, please submit it together with the transcript. If your school doesn’t provide you with GPA and if you calculate it yourself, please submit the document that shows how you calculated it. One certified copy (with certified seal/stamp of the university you belong to or graduated from) is required. Photocopy without certified seal/stamp will not be accepted. A photocopy of your valid passport (the most preferable), census register, or other proof of citizenship. If the document is written in language other than English or Japanese, please attach English translation. You can translate by yourself. Please submit (A), (B), or (C). TOEFL (or IELTS): One copy of your TOEFL score is required. You do not have to submit the original official score report. Please DO NOT send it directly from ETS Center to the University of Tokyo. If the official score report is not ready by the time of shipping out the application documents, please include the printed out on-line score. And as soon as you receive the official score report, please send the scanned copy by e-mail. The Certificate of English as the Medium of Instruction from your university. One original or one certified copy (with certified seal/stamp of the university you belong to or graduated from) is required. Photocopy without certified seal/stamp will not be accepted. If it is stated in your transcript, you do not have to submit an extra document. In that case, please underline the part which explains it. If English is your native language, you do not have to submit any of the above document. Instead, please submit proof of citizenship, such as a copy of your valid passport. The validity period for scores of the document is within 2 years at the deadline of the documents submission. Please arrange so that ETS Center can directly send it to the University of Tokyo. When you cannot make the official score report arrive at the UTokyo by the deadline of submission of paper-based application documents, please include the printed out on-line score in the package.If even the on-line score is not ready when you ship out the paper-based application documents, you can submit later the scanned copy of it by e-mail as long as you can send it to us by the deadline of submission of paper-based application documents. The validity period for scores of the document is within 5 years at the deadline of the documents submission. If it is impossible for you to submit GRE score before the deadline, please refer here. 19 Acceptance Letter from your prospective supervisor. 20 Enclose this Submission Checklist whenever you send materials to the ICT Admissions Desk via post. IME Graduate Program applicants must apply through the T-cens, an online application system for the Graduate School of Engineering, the University of Tokyo. First, please read all the following procedures carefully, and follow the instructions step by step according to the numbers. Please never skip any steps. IME Application Procedure 1: Find your prospective supervisor at the University of Tokyo. You must find your prospective supervisor whose research field matches yours from the academic staff involved in IME Graduate Program from Academic Staff List ( http://www.ime.t.u-tokyo.ac.jp/index.php?id=5 ) . Only those who receive an acceptance letter from prospective supervisor are eligible to proceed to the next application step for IME Graduate Program. It is essential to receive the acceptance letter prior to submitting paper based application forms by post. The application forms submitted without having received the acceptance letter cannot be accepted. It will take plenty of time to contact the prospective supervisor and receive the acceptance letter, so please complete your on-line application well in advance. Choose up to two suitable professors. You are supposed to write the names in the application Form 5,“Name of faculty member”. Please fill in at least one professor. You may start contacting him/her after completing up to IME Application Procedure 8. IME Application Procedure 2: Create your T-cens account. You can create your T-cens account by clicking the blue T-cens icon below. Please keep this e-mail from T-cens. You will need the information there for various purposes later on until your entrance formalities become complete. T-cens system messages will be sent to your account page when necessary. Each time a new message is sent to your account page, an e-mail is sent to your registered e-mail address. Please be sure to read a new message whenever you receive one. Again, whenever you contact IME Graduate Program Office or ICT Support Desk, please only use the e-mail you used to make your T-cens account. When you need to change your e-mail address, please first inform the Offices about the change of e-mail address. Your T-cens Application Number (Registration No. + Course Code) can be found under the space for your photo on your acount page. Please clarify your T-cens Application Number in your e-mail subject line whenever you contact the IME Graduate Program Office or ICT Support Desk. IME Application Procedure 4: Fill in the Application Forms in T-cens. Click “Apply” icon on your account page, and fill in Online Application Forms from Form 1 to Form 7. After you complete all the Forms and save them, please proceed to “File Upload”. Before you switch to a different Form, please press the “SAVE” button. Otherwise all the information you have filled in will be erased. IME Application Procedure 5: Upload files. the one taken within 6 months prior to the application. Download and fill in AF2 - AF4(1-7), and upload them. Upload all the other required files on the list. All the files should be PDF file and less than 2MB each. The name of the files you are going to upload should be completely the same as the one on the list. Otherwise, you will not be able to upload the file. If you need to replace the files after pressing the COMPLETE button, please contact IME Graduate Program Office. IME Application Procedure 6: Complete Recommendation Documents. Please fill in the required information of your referees. Your referees must be the members of the faculty of the university you belong to or graduated from. Both must be the faculty member of the university and one of them must be your direct academic supervisor. You MUST get an approval from both of your referees before filling in their information. Soon after you register your referees, they are supposed to receive an e-mail from T-cens with the information to start uploading recommendation documents. Please confirm whether your referees have received the e-mail from T-cens system, and if not, please contact ICT Support Desk and ask for their assistance. Both referees have to finish uploading recommendation documents before you move on to IME Application Procedure 7. Both referees have to finish uploading recommendation documents by the IME Online Application Deadline, February 28th, 2019. Please check the status of your own recommendation letters on your responsibility and make sure that they can submit the recommendation documents online by the deadline. IME Application Procedure 7: Press "Submit" tab and "Submit" button. Click “Submit” tab at the top, and review all the contents of your online application documents as well as the status of the recommendation letters. After confirming the contents you have written in the application form and confirming that both of your referees have already submitted the recommendation documents online, please check in the squares in the checklist, and press the “Submit” button at the bottom. IME Application Procedure 8: Contact IME Graduate Program Office. Please inform IME Graduate Program Office of your T-cens Applicant ID Number and the completion of IME Application Procedure 1-7. Then IME Graduate Program Office will arrange so that your prospective supervisor could view your online application documents. IME Application Procedure 9: Contact the prospective supervising professor. After you receive a reply from IME Graduate Program Office, you can proceed to contact your prospective supervisor and ask whether he/she could accept you in his/her laboratory. This procedure is considered to be a preliminary evaluation of your qualification. Please understand that not all the applicants are able to receive the acceptance letter. When your prospective supervisor agrees to accept you, please contact IME Graduate Program Office by forwarding his/her e-mail. IME Office will ask him/her to send the acceptance letter directly to you and IME Office by e-mail. Please do not contact your prospective supervisor until you receive the reply from IME Graduate Program Office. Please inform your prospective supervisor of your T-cens Applicant ID Number and introduce yourself. You must contact the prospective supervisors one by one. If you do not receive any reply from the prospective supervisor, please contact the IME Graduate Office. IME Application Procedure 10: Receive an acceptance letter. When your prospective supervisor agrees to accept you or when you receive the electronic version of the acceptance letter, please contact IME Graduate Program Office immediately. Being able to receive the acceptance letter means that you pass the first screening. When professor has declined, please contact the IME Graduate Office as well. Only those who received the acceptance letter could proceed to the Application Procedure 11. IME Application Procedure 11: Submit paper based application documents. Please send all the required documents to IME Graduate Program Office by EMS or another international delivery service so that they can arrive at the Office by March 20th, 2019. Refer to the checklist and prepare the documents as requested. Please DO NOT PRINT ON BOTH SIDES. Please send documents in A4 paper size only except in a case to send original document (such as certificate) which is not A4 paper size. As soon as you ship out the package of your application documents, please inform IME Graduate Program Office of its tracking number and its scheduled delivery date. The package must reach IME Graduate Program Office by March 20th, 2019 at the latest. The package that arrives at IME Graduate Program Office later than March 20th, 2019 are not acceptable for any reason. ※ Please note that none of the submitted documents and materials will be returned. 3) operations related to the collection of tuition fees.